We investigate workload-directed physical data clustering in native XML database and repository systems. 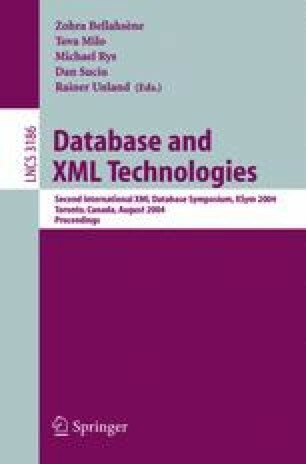 We present a practical algorithm for clustering XML documents, called XC, which is based on Lukes’ tree partitioning algorithm. XC carefully approximates certain aspects of Lukes’ algorithm so as to substantially reduce memory and time usage. XC can operate with varying degrees of precision, even in memory constrained environments. Experimental results indicate that XC is a superior clustering algorithm in terms of partition quality, with only a slight overhead in performance when compared to a workload-directed depth-first scan and store scheme. We demonstrate that XC is substantially faster than the exact Lukes’ algorithm, with only a minimal loss in clustering quality. Results also indicate that XC can exploit application workload information to generate XML clustering solutions that lead to major reduction in page faults for the workload under consideration. 1.IBM T. J. Watson Research CenterHawthorneU.S.A.